I am super excited to announce my 2nd book as an author. The overall book comprises of three sections with two chapters in each section. The first section prepares the reader with all the necessary gears to get started on the fast track ride in deep learning. Section 2, engages the reader with tangible business use-cases that delve in the depth of deep learning model development, training and validation. And, Section 3 highlights model tuning for improved performance and highlights the path ahead for advanced topics in deep learning. 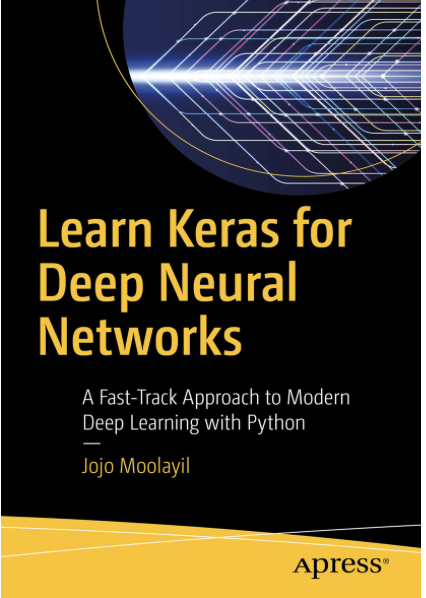 Chapter 1 introduces the audience to the world of deep learning and delineates its difference from machine learning, the choices of available frameworks and explores the Keras ecosystem. Chapter 2 helps the reader build the foundations of deep learning in Keras by exploring its logical building blocks in a math-friendly way with simple dummy models and hands-on practise exercises. Chapter 3, explores a business problem from popular Kaggle datasets and renders the end to end solution with deep neural networks for regression and chapter 4 tackles another business case for classification. Chapter 5, explores regularization, hyperparameter tuning and model deployment. Finally, Chapter 6 – the conclusion, discusses the path ahead for the reader to further hone his skills in deep learning and discusses few areas of active development and research in Deep Learning. At the end of the book, the reader will have a thorough understanding of the deep learning principles with practical hands-on experience in developing enterprise-grade deep learning solutions using Keras in the shortest yet effective way. Fast paced practical deep learning concepts with math and programming-friendly abstractions. Design, develop, train, validate and deploy deep neural networks using industry’s favorite Keras framework. Best practices for debugging and validating deep learning models. Extending deep learning principles into other popular frameworks. The major target audience for the book is software engineers and data engineers with basic programming skills in any language and keen on exploring deep learning for a career move or an enterprise project, data science enthusiasts, academics and research professionals. What’s next for Deep Learning expertist?